We woke up early this morning to explore the mangroves. We saw mangroves (of course), sea turtles, conch, egrets, and what we thought might have been a bonefish. It was beautiful. However, the real surprise was waiting for us by the entrance. 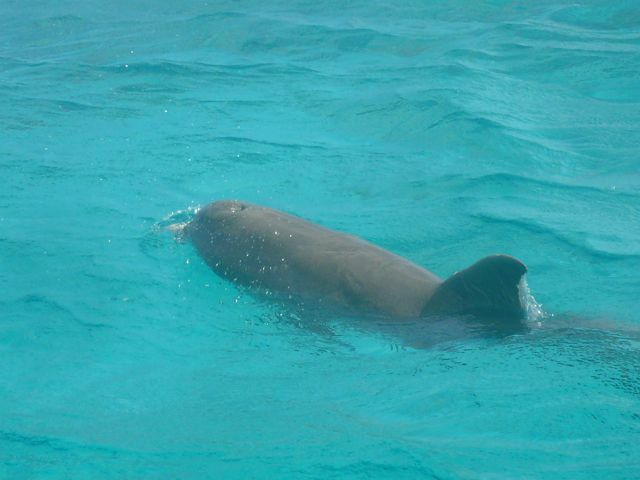 Two bottlenosed dolphins. They swam over to our dingy, curious and distracted from their fishing venture. They turned sideways a few times, looking up at us. Spinny was enraptured by them, but the encounter was not to last. The dolphins turned back to the reef to continue finding breakfast. Gary is very proud of his catch. The rest of the day was spent sailing over to Cat Island. The rollers were high and the ride was, again, rocky. I started to feel a little sea sick myself. Carol had taken a Dramamine in preparation for the trip. Gary was eager to get over to a large underwater bank over to the west of Cat Island. He’d heard there was prime fishing out that way. As it turns out, there is. Gary hooked two 6ft long fish of some kind, but they got away before we could get a good look at them. Gary thought they might be sharks or Oahu. A half an hour later, Gary caught a dolphin, or a mahi mahi. It was quite the struggle. Kris couldn’t get a good angle with the net at first, but Gary and he got the fish in. The mahi mahi was bright and colorful in the water – blue, green, and bright yellow. However, after being out of the water for a while, he began to loose his color, as if he got his strength and energy from the sea which had been denied him. But the excitement wasn’t over yet. Someone else caught word, or sent, of the fact that Gary had caught a fish. Dolphins, but the mammalian kind. A whole pod of them, swimming in our wake, eating the scraps of the fish as Gary cleaned it, playing happily in the water as it rushed around our boat. These dolphins were Atlantic spotted dolphins, smaller than their bottlenose brothers from this morning. 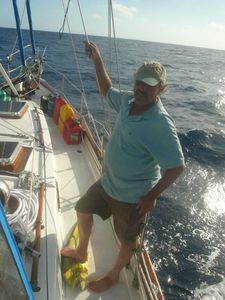 Kris and I shot from video footage as well as photos of them from the bow sprit. Kris’ video is posted on youtube, and in the previous post on the blog. 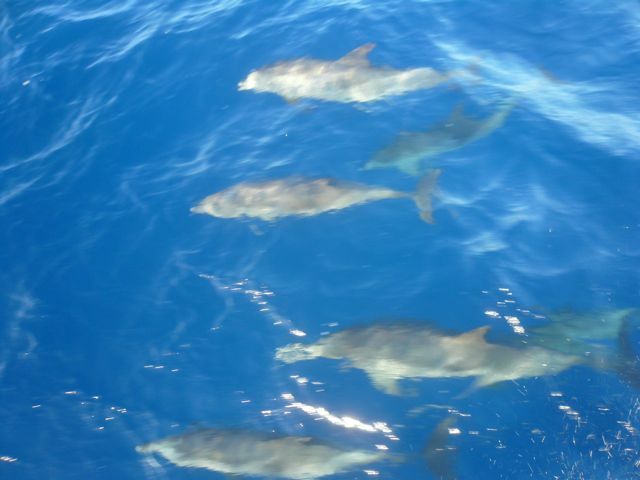 The dolphins stayed for a good 10 or 15 minutes, crossing over each other, turning sideways to get a good look at us. When they finally left, they is so with gusto, giving us one good look before speeding off, one by one, shooting and leaping through the water like live torpedoes. It was an amazing moment to witness. We came into harbor at New Bight, Cat Island after dark. Anchoring was easy enough and then we could turn our energy to making a delicious fish dinner. Mahi mahi has a light flavor that is reminiscent of chicken. Thank you Gary for the wonderful meal! It’s a dolphin! The mahi mahi kind. Dolphins in the wake. Atlantic spotted dolphins. Waves splash against the bow.